As I was following the progress of the quake relief and rescue efforts, it seems like we have underestimated the actual magnitude of the aftermath. Death toll is now 15,000 and counting. Then I came across this photo and for once, I envied the Ch1nese people. They have a great leader. A man whose power is multiples of what our own leaders are ever capable of, and yet grounded, compassionate and humble by multiples of what our own leaders will ever be. I ask why can't we have someone like Wen J1a Bao in Singapore too? Skeptics may say that these photos are deliberately taken to boost his public image i.e. he is purposely doing all this for the sake of gaining popularity. Well, yes and no. Sure, a leader has to maintain a good PR but even if all these are fakes, you still have to give him credit for his efforts for he is always at the scene of the incident, whenever there is a disaster like the mega snow storm during the last CNY. And mind you, it's not like he turn up to show face, get a few pictures taken (don't forget the flower garlands!) and then leave. He actually stayed on-site until a time where he thinks that the rest of the staff can wrap things up on their own. He is still there in SiChuan now, is he not? I look at all his pictures pertaining to the quake. I can see from his eyes then he is genuinely concerned about the people. You want to tell me that's just good photography? I begged to differ. Emotions were stirred up in me not because I am looking at pictures of the tragedy. I am not moved by the crying father who hugs his dead son. I am not moved by the 9 kids lying motionless when they finally remove the slab of collapsed wall. I was moved when I see Wen holding the kids in consolation. 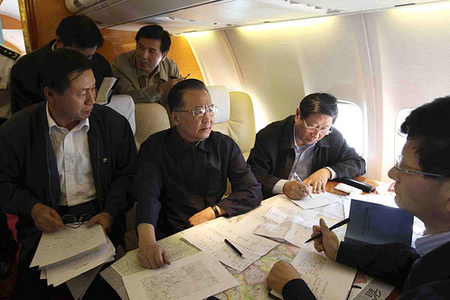 I was moved when I see Wen doing ops planning while still in flight en-route to disaster site. Then, I look at our own. What do we have? A man whom we paid 3 million bucks a year to run the country. Yes, on paper, he has done relatively well but why are people still so unhappy with him? Instead of endearing, good, great, humble, friendly, nice to describe him, why do I, more often than not, see the words like aloof, elitist, arrogant, detached in relation to him? I don't recall much of what our leaders actually DID during the Nicholl Highway Collapse or when Mas Selamat escaped. Hmm.... maybe we need better photographers for them. Seriously, I think we got a lousy deal. The merchandise quality may be good, but I think it is way over priced. Can we get someone who is better value-for-money in the next election? For once, I see true compassion in a politician's eyes and that photo of him comforting the two little girls is poignant. Agree... TOTALLY AGREE with you.. Maybe if we can get a better one, less Singaporeans will be thinking of leaving..
Our leaders (and I use that term loosely) are no politicians. They are professional managers. They are only capable of using hard facts and logic to justify their policies, and get frustrated when the simpleton electorate (that term loosely used too) fails to grasp their concepts. When was the last time you felt inspired by one of them ? Some Singaporeans are enthusiastic Obama supporters because they hunger for some REAL leadership. Winning hearts and minds for our administration ? That's for lesser, poorer-quality governments. What d'ya mean comments getting cut off? Please let me know, email me in detail if possible. If it's a problem with my blog, I would be more than happy to resolve it. Chocolate Gal: We need someone who can win the hearts of the people, who in turn would love the country wholeheartedly and unconditionally. LittleCartNoodles: When was the last time? I can only think of one person. Ong Teng Cheong. I am rooting for Hillary but I do concede that Obama has charisma although he is faring very poorly with the white working class. and when u add to the fact that the country is so much bigger than us and the enormous task of managing such a huge country, one must really give credos to a compassionate and capable leader like him. What happened to your previous post btw? aloe: Ahh.... but let us not put them too high on a pedestal for they are not perfect either for a country that is relatively more corrupt than our supposedlly squeaky clean country. Hey, if the law passes the $3 million package, it is not stealing coz it is legal! The previous entry was accidentally flicked back to draft mode. Resolved already. OK on a serious note, when I try to think of someone who will put as much passion and humility into serving our country like WJB, I only have ppl like Low Thia Khiang, Sylvia Lim and Chiam See Tong in my mind. Speaks volumes, doesn't it? Where all credit is due, LKY too during the infant years of the nation too. Speaking of Chiam See Tong, he is getting old and I wonder if there is anyone out there worthy of carrying on his legacy? well, at least your PM is better than our Pak Lah by miles. Spiller: Welcome to the blog! So in your opinion, you would have preferred Dr M to be in power over Pak Lah? well, i believe the transition made from Dr M to Pak Lah was intentionally good. but after 2 terms of GEs, we see Pak Lah's weaknesses and i believe he has to improves or be replaced. but no, not Dr M anymore. i believe Dr M is trying to drag him down, so Najib can take over and thus preventing Anwar from raising to power. Spiller: Question 2. What would happen if Anwar rise to power? Haha, I wish i have the answer for that. First he will have to survive these 4 years before the next GE. If he does survives and elected, then he deserves to be where he'll be. I mean, from opposition leader to PM of Msia, that's something extraordinary right? spiller: From opposition leader to PM would be a milestone in Malaysia's political history. My only fear for fellow Malaysian brothers is the conventional folly to vote the village idiot just to spite the incumbent like what Ta1wan did when they voted in Chen Shu1Bian, 8 years ago. I do hope that vote goes to the candidate who is truly ideal for the job instead of turning it into some popularity pageant.